At Spencer Fabrications, we pride ourselves in our ability to provide customized, durable, quality products with environmentally friendly features. 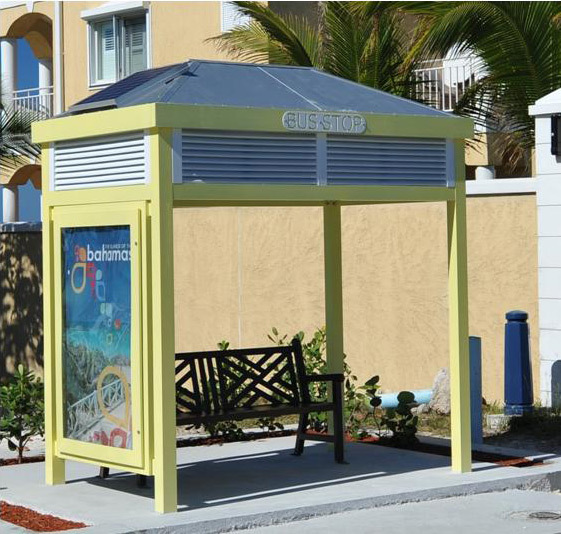 A local media company contracted us for a custom fabricated bus shelter that included a solar powered side-lit advertising panel. Our role in the process was comprehensive. We developed CAD drawings for the shelter, fabricated the unit using a combination of aluminum and steel, and incorporated vandal-resistant polycarbonate panels and an acrylic polymer finish. We included features in our development that enhanced the aesthetics of the shelter and made it the perfect product for our customer's needs. The solar powered side-lit advertising panel is a lockable unit that allows for interchangeability of the advertising copy. The shelter met local wind load requirements, was finished with a durable paint for longevity, and was visually customized to fit in with the local hardscape. The customer was pleased with every aspect of our work and has come back to us for additional project partnerships. Contact Spencer Fabrications, Inc. today for more information. 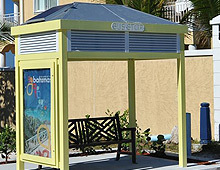 Bus Shelter with Solar Powered Advertising Panel This custom fabricated bus shelter is equipped with a solar powered sidelit advertising panel, which makes it environmentally friendly, and eliminates the need to run electrical power to the site.